We tell you about our safari The "Thar" engulfs in itself three prime cities of Rajasthan - Bikaner, Jaisalmer and Jodhpur (Osian). Around these cities, one finds huge and endless stretches of sand dunes. Thar is a culture, a life in itself, a home for many trebles, animal and bird species. You will surely be amazed to see this different kind of ecosystem where inspire of harsh conditions in summer, without water, flowers bloom (a cactus specie) and reptiles venture out of earth. The evenings are much cooler than you can expect and it is more marvelous to sit among sand dunes in evening, with campfire on and folk music sulking inside with countless stars overhead. Inspired by the THAR, our camel safari is also named after it - THAR CAMEL SAFARI because it gives you a complete flavor of the region combined with the traditions and color of earth. Hail to the ship of the desert - CAMEL, without it you cannot expect life in this region of the world. An animal with great courage and temperament. It takes you through the vats. It has been a medium of transport for centuries in Thar. We have physically well built camels with us, who are well acquainted with their surroundings and the routes. You will love to see this beautiful animal. 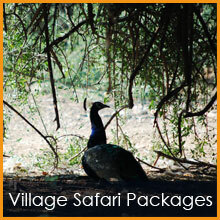 Osian, an ancient small temple town in the Thar Desert, is located about 65 kms, North West of Jodhpur. Osian is a great centre of Brahmanical and Jain religions and contains the largest group of the Hindu and Jain temples in Rajasthan. These temples belong to the two periods, namely 8th century represented by nearly 12 temples and 12th century represented by 6 temples. In the medieval period, Osian was a large and bustling town and caravans from Arabia, Persia, Afghanistan and central Asia arrived here for trade. Osian was also the capital of the Gurjara Pratihara dynasty from the 8th to 12th century. Osian was an important centre of pilgrimage between the 8th and 9th centuries. This can be known from the surviving Hindu temples of the Vaishnava, Surya (Sun) and Shakti (mother goddess) sects. The Brahminical influence was very strong in Osian during that period and later, Jainism also flourished in the place through the Gurjara Pratihara dynasty. But still, various Hindu devotees visit the Osian temple dedicated to the goddess Sachiyamata. In ancient times, Osian was known as Ukeshpur. The tour departs at 2:00 pm with a 65 kms jeep drive to Osian. Visit Osian temples (Mahaveera and Sacchiya Mata Temple ), adventures start with a camel safari, visiting various villages in the remote areas and experiencing the desert wild life. Here you can experience the stark beauty of the mysterious desert which beckons you to enjoy a magical sunset with Dinner and an adventure you will never forget. And then we back to Jodhpur or our homestay at 8:00 Pm. Contact us for rates by call or email anytime.